Tian is a type of gratin, typically vegetables baked in an earthenware dish. (The word “tian” also refers to the earthenware dish itself.) 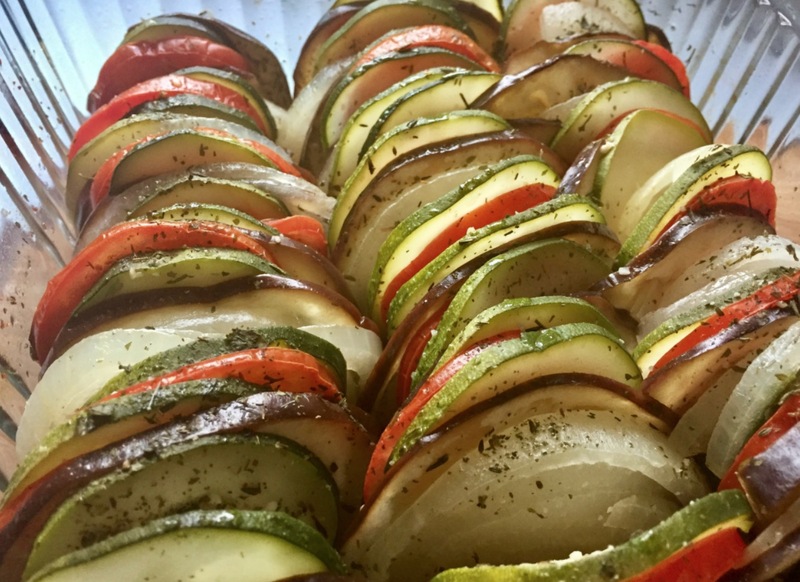 This classic Provençal version is made with alternating rows of sliced zucchini, eggplant, tomato, and sweet yellow onion. 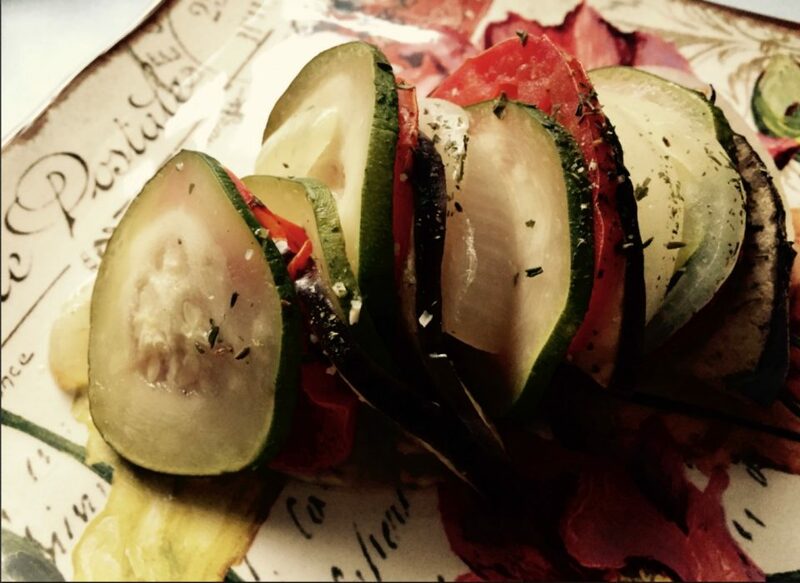 The flavors meld as the vegetables cook together, somewhat like ratatouille. Seasoned simply with thyme, garlic, and olive oil, the dish is best served at room temperature. Prepare the baking pan by greasing it with oil and minced garlic. I don’t have an earthenware disk so I used an 8×8-inch glass baking dish. 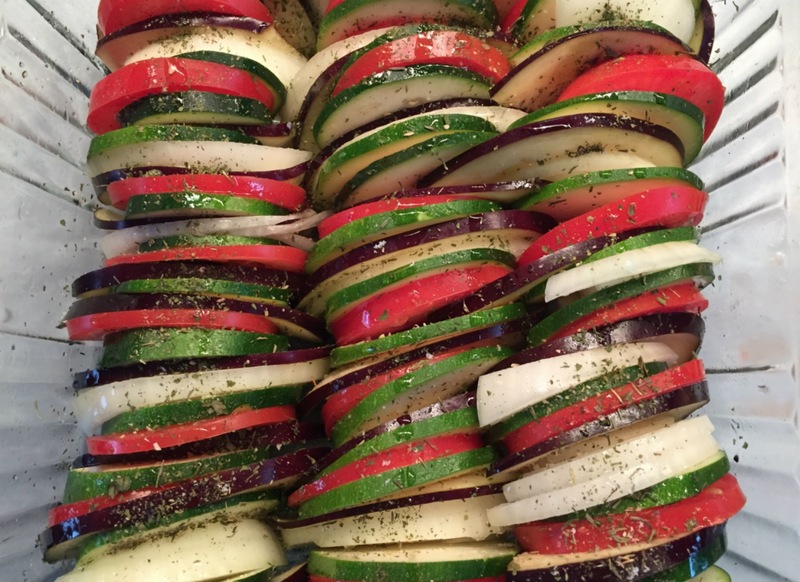 Arrange the zucchini, eggplant, tomatoes, and onions, alternating vegetables, standing them vertically on edge, packing the rows tightly together. Continue until the baking dish is filled. Sprinkle the surface of the vegetables generously with salt, thyme, and garlic, then drizzle with olive or avocado oil. Bake covered for 45 minutes. If vegetables aren’t quite fully cooked, uncover, reduce heat to 350° and continue baking for 15 minutes or until the vegetables are tender. Cool dish to room temperature to allow flavors to meld. To serve, garnish with torn basil or parsley leaves. A dollop of crème fraîche would be delicious too.